* Try keeping a neutral backdrop with gray, silver and white. Layer in pops of color with accessories and ornaments to keep things from getting too busy and bright. * A little bit of fuchsia goes a long way, so use it sparingly (I chose to incorporate a pink tree and flowers as the primary pink accents for this design). * Instead of placing an arrangement of flowers in a vase, float single blooms in stemless wine glasses for a modern and sophisticated twist. * To keep the overall look festive, be sure to incorporate shiny silver accents into the decor. * And finally, have FUN while decorating for Christmas! Try new things, be open to fresh ideas and don't stress over any of it! To get a better look at my moodboard and for info on all of the products used, click here. For even more holiday décor inspiration, check out the other blogger-created spaces showcased on Olioboard every day this week. Tomorrow, take a look at what Adrienne from 2modern has put together! This is almost exactly what I did for my Christmas decorations this year. Plenty of silver some white, crystals, black, and fuschia! I love it so much. 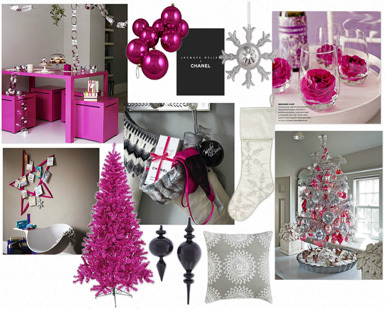 I never thought about Pink for the holidays, but I love it! I think I am going to try to add that in my decorations this year! I love that you share your ideas and suggestions!.. already wrapped a piece of art-canvas I had at home.. So glad I came over here from A Perfect Gray! Love this board...the colors are gorgeous. I am all over pink right now.